Whether you need a professional security stand for display, point-of-sale or business use, CTA Digital’s Universal Dual Security Kiosk with Locking Holder and Anti-Theft Cable for iPad, Surface, & 7 – 13 Inch Tablets will provide the features you need. 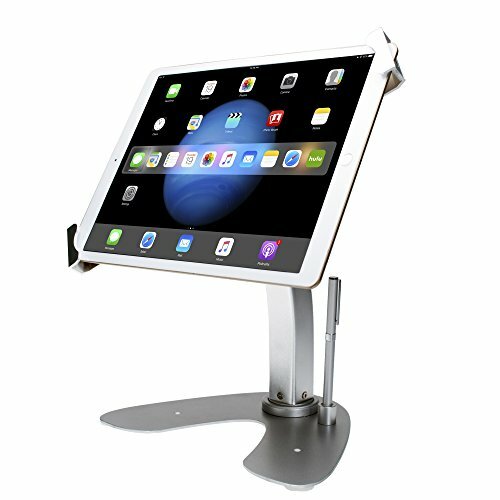 This stand is made of strong and stylish aluminum with the perfect design to serve as a workstation, kiosk display or retail POS tablet stand. The aluminum enclosure securely grips 7 – 13 inch tablets, adjusting to fit tablets such as iPad mini, iPad Air, iPad Pro, Galaxy Tab, Surface Pro, and everything in between. For an optional added measure of theft protection, a locking steel cable attaches to either the stand base or holder, securing easily to any permanent fixture. The stand can tilt to easily adjust the viewing angle and rotate for horizontal or vertical views. The base can also rotate a full 360 degrees to easily switch from register to customer-side transactions. The anti-theft holder grips diagonally and is securely locked closed with the included keys. The large base and solid stand offer stability and can be installed onto a desk or countertop either through predrilled holes and included mounting hardware, or using the included set of double-sided adhesive silicone pads. An elegant all-in-one stylus and ballpoint pen is included and can be conveniently stored in the built-in holder found on the base. Keep your tablet charging while in use with clean cable routing through the stand. The case and bottom of the base are also padded to help protect your device and furniture. If you have any questions about this product by CTA Digital, contact us by completing and submitting the form below. If you are looking for a specif part number, please include it with your message.